Home / General Business / WEBSITE DEVELOPMENT / Solera Inc.
Based in Dallas, Texas, Solera Inc. is the world’s leading provider of software and services to the auto insurance claims processing industry. At the time of the project (2011) this global automotive software/services holding company operated 10 businesses in more than 52 countries across 6 continents. Revenues were $838.1 million dollars year-end 2013; and $790.2 million dollars year-end 2012. Solera Inc. decided it needed a new, modern website to reflect its high-tech industry and worldwide footprint. It hired BastianPR to do all the content development work, and a graphic design agency to do the website design and coding. After consulting with management, Bastian began researching the company’s “DNA” and reviewing quality corporate websites to determine how best to put together a dynamic sitemap. Once that foundational piece was approved, she then researched, wrote and edited content for all areas of the new website; including executive bios of the President and his top managers. Bastian also worked closely with the graphic designer throughout the months-long process. The resulting website received rave reviews, both internally and externally. 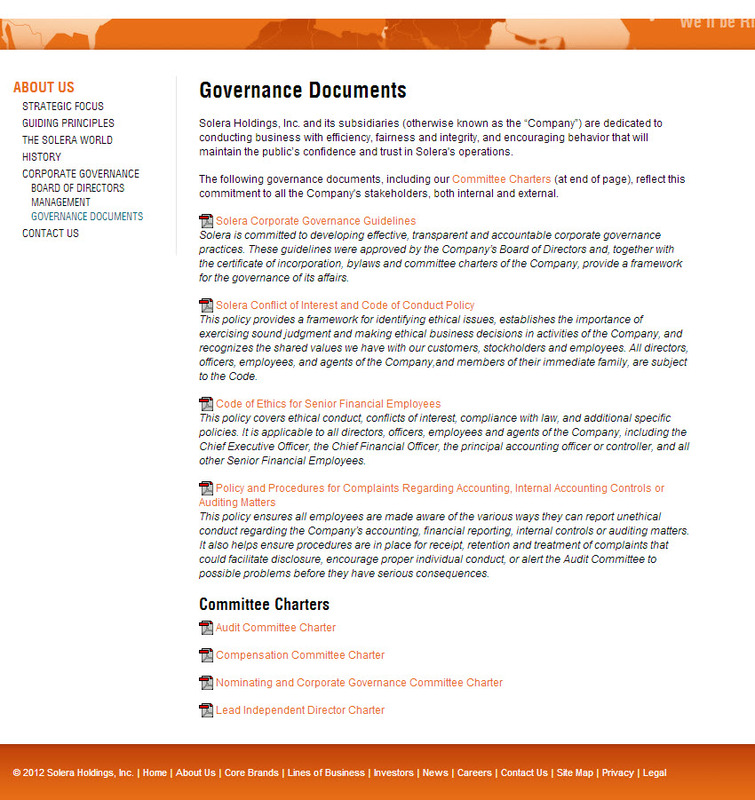 Research, writing, editing, interviewing of C-suite peeps, collaboratively working with client-provided website designer. 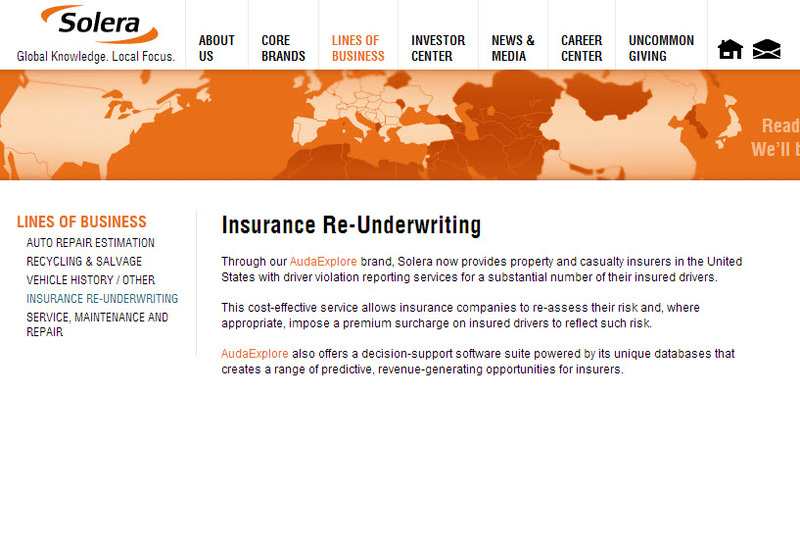 Solera is the leading global provider of software and services to the automobile insurance claims processing industry. 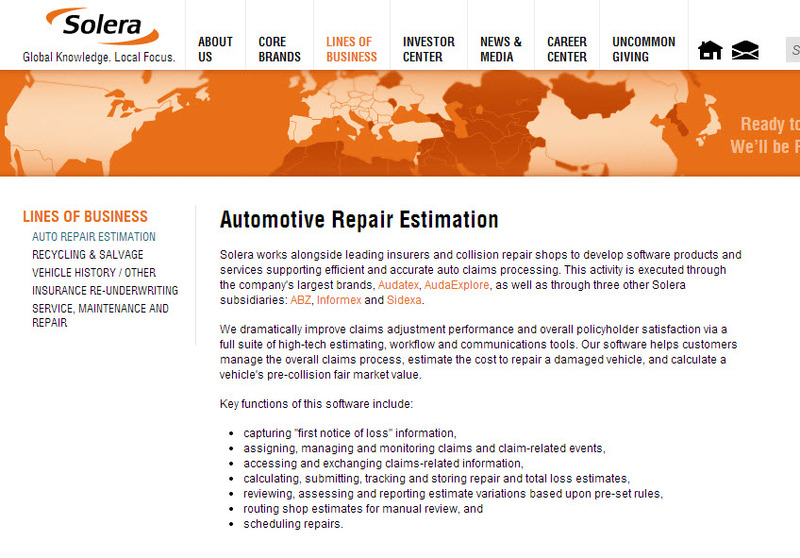 For almost half a century, products and solutions developed by Solera companies have helped insurance carriers, collision repair facilities, automotive recyclers and financial services firms streamline their business operations and operate more efficiently. Below is a timeline briefly outlining many of our corporate milestones. Solera will continue to leverage our operating principles and drills in order to drive customer and shareholder value as we march towards our goal of $1 billion in revenue and $450 million in EBITDA by Fiscal Year 2014. Solera purchases a majority stake in Sinexia Corporación Tecnológica, S.A., a Spain-based provider of workflow solutions for insurers and assessors. Solera purchases K&S Beheer B.V., the Netherland’s premier collision repair shop management system. 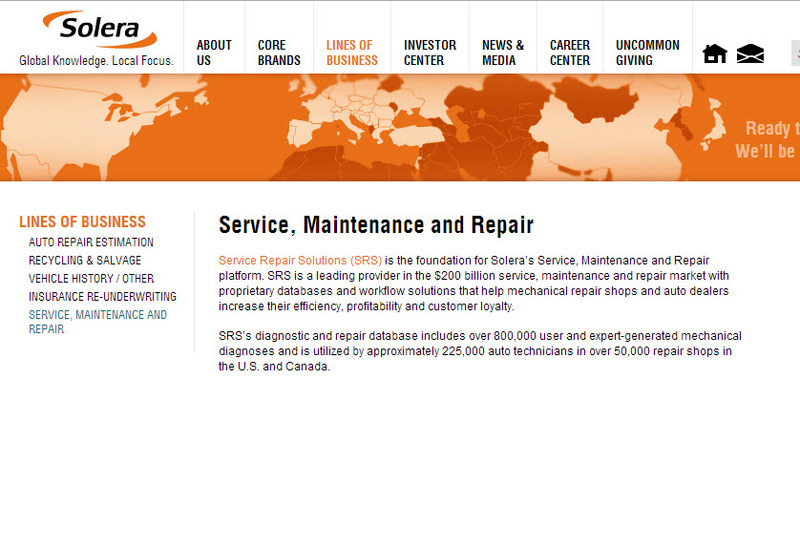 Solera purchases See Progress, Inc., a U.S.-based provider of vehicle repair stats software solutions. 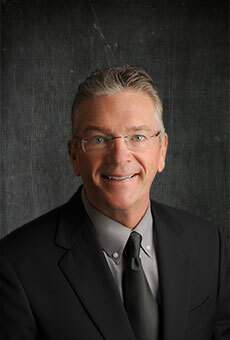 Solera purchases New Era Software LLC, a U.S.-based provider of body shop management systems. Solera operating company, Hollander, agrees to purchase assets from Inventory Technology Systems, Inc., a U.S. provider of solutions that significantly enhances salvage yard profitability. Solera completes acquisition of Explore Information Services, LLC, a leading U.S. provider of innovative data and analytics services used by automotive property and casualty insurers. 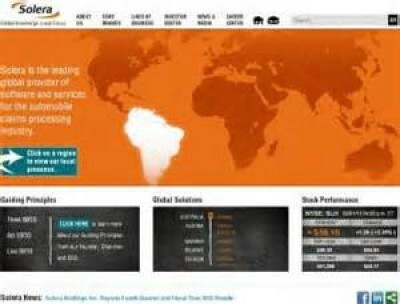 Solera posts FY2011 revenues of $684.7 million and adjusted EBITDA of $295.3 million. Solera moves its worldwide corporate headquarters from San Diego, CA to Westlake, TX (located in the Dallas/Fort Worth metroplex) to help the company better serve the needs of its global clients. Solera acquires Market Scan Holding B.V., a leading data analytics and software firm serving the Dutch insurance industry. Solera purchases a minority equity stake in Digidentity B.V., a Dutch company providing next-generation E-identification certificates used for authentication of online identities. Solera posts FY2010 revenues of $613.3 million and adjusted EBITDA of $261.9 million. 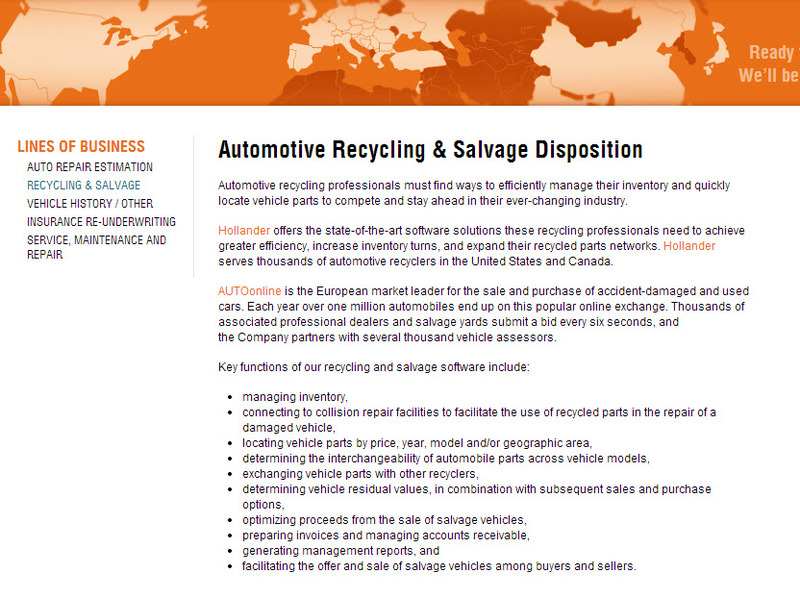 The Company signs an agreement to acquire up to 100% of AUTOonline GmbH Informationssyteme, a leading European eSalvage vehicle exchange platform which brings together buyers and sellers of salvage and fleet remarketing vehicles. Solera posts FY2009 revenues of $557.7 million and adjusted EBITDA of $208.6 million. HPI becomes part of the Solera Holdings, Inc. group of companies. The Company acquires Universal Consulting Software GmbH, a leading provider of software and services to collision repair facilities in Germany with more than 1,200 collision repair facility customers. 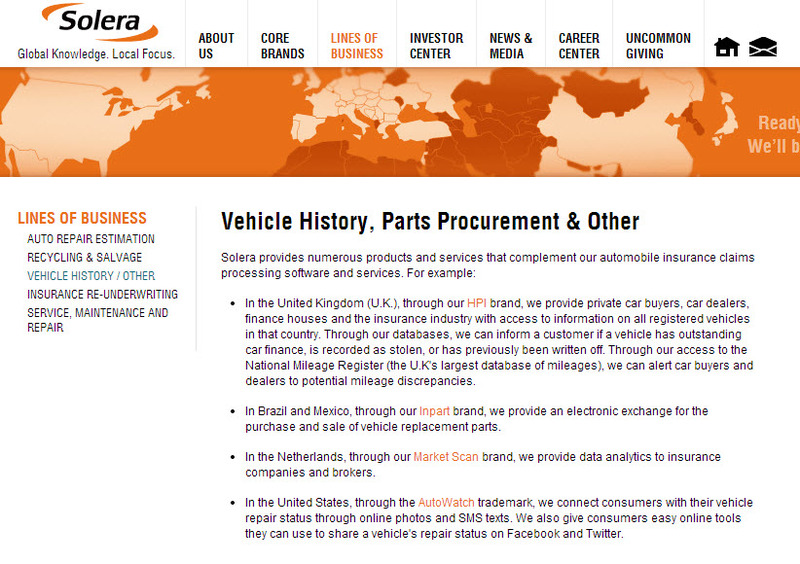 Solera acquires Inpart Servicos Ltda., a leading electronic exchange for the purchase and sale of vehicle replacement parts in Brazil. Solera posts FY2008 revenues of $539.9 million and adjusted EBITDA of $185.5 million. Solera completes a $420 million initial public offering. Audatex enters an additional 14 countries. Company completes a secondary stock offering. Solera acquires ADP Claims Services Group together with leading U.S. private equity firm GTCR Golder Rauner, LLC. ADP Claims Services Group acquires ABZ, the Audatex licensee in the Netherlands, and expands business to provide new technology services beyond automotive claims. ADP Claims Services Group acquires Audatex and continues European, Middle Eastern and African operations under the Audatex brand. ADP Claims Services Group expands the business to include an additional 16 countries. The North America operation launches ClaimsFlo, an automated business process application. ADP Claims Services Group acquires Hollander, the North American auto recycling and parts yard management systems provider. Audatex expands its business to more than 10 European countries. ADP Claims Services Group launches the North American market’s first portable, handheld, automated vehicle estimating application. Audatex establishes business operations in the United Kingdom. ADP Claims Services Group acquires AutoTrak, and expands its product offerings to include automotive total loss valuation services. Audatex establishes the Sidexa brand and business operations in Belgium. Automatic Data Processing, Inc. (ADP) Claims Services Group in North America acquires the licensing rights for the Audatex automated vehicle repair estimating application from Itel Corporation. SwissRe grants an exclusive North American license for Audatex to Fireman’s Fund Insurance Company. 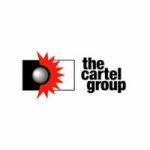 The insurance carrier becomes the first North American provider of automated vehicle collision partial loss estimating. Later, the North American license is assigned to Itel Corporation. Audatex is established with the SwissRe acquisition of Audatex Reuter, the world’s first automated vehicle repair estimating application. 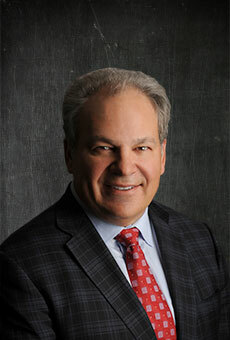 Tony Aquila founded Solera Holdings, Inc. (NYSE: SLH) in January 2005 with a vision to transform the automotive insurance claims industry. Partnering with GTCR Golder Rauner, a leading private equity firm, Solera purchased the Claims Services Group of Automatic Data Processing, Inc. (NYSE: ADP) for $975 million in April 2006. Under Mr. Aquila’s leadership, the Company has greatly increased revenue and expanded its geographic reach. In May 2007, Solera closed its initial public offering (IPO) on the New York Stock Exchange. Six months later, the Company completed a secondary stock offering. Mr. Aquila has more than 20 years of global experience in the manufacturing, distribution, automotive software and collision repair industries. He also has co-invented and patented several products. Prior to establishing Solera, Mr. Aquila founded MaxMeyer America Inc. (a subsidiary of MaxMeyer Duco, SPA of Italy), an importer and distributor of European refinishing products. He sold this business in 1997 to Fortune 500 company PPG Industries (NYSE: PPG). After that, he founded and served as CEO of Ensera, which developed software that streamlined the automotive collision claims workflow for insurance carriers. 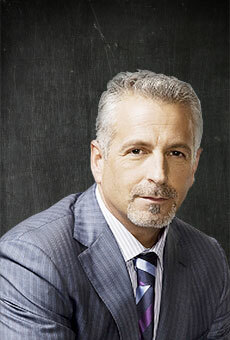 Ensera was sold in 2001 to Mitchell International, which appointed Mr. Aquila as its President and COO. Stuart Yarbrough, CEO of private equity firm 3Point Capital Partners, has served on the Solera Board of Directors since 2007. Previously, he was a co-founder and principal of CrossHill Financial Group, a venture debt firm. His responsibilities included representing growth companies in investment banking transactions, closing “merger and sell” transactions with a total value of over $1.5 billion, and placing capital in excess of $1 billion. Prior to that position he spent 22 years in public accounting. He began his career with Ernst & Young, and after five years there founded Adams & Yarbrough, an accounting and consulting firm. In 1985, when BDO Seidman acquired Adams & Yarbrough, it recruited Mr. Yarbrough as managing partner of its Washington, D.C. office and elected him to its U.S. Board of Directors. In his nine years with the Company, his client responsibilities have involved working closely with both the BDO Seidman SEC Practice Unit and the SEC. Renowned as an “audit committee financial expert,” he served on the Board of Directors of DigitalNet Holdings, Inc. (NASDAQ: DNET) and was Chairman of its Audit Committee prior to being acquired by BAE Systems, North America. 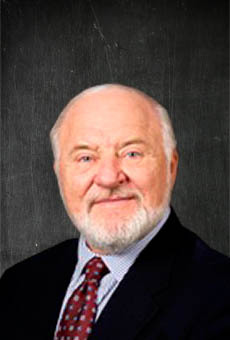 More recently, Mr. Yarbrough served on the Board of Directors of Riggs National Corporation (NASDAQ: RIGS) and Riggs Bank, N.A. (prior to its acquisition by PNC Financial Services Group) and SBR, Inc. (prior to its acquisition by Fortune Brands, Inc.). A Certified Public Accountant, he has held Professional Securities Licenses as a General Securities Principal (Series 24), General Securities Representative (Series 7), and Uniform Securities Agent State Law (Series 63). 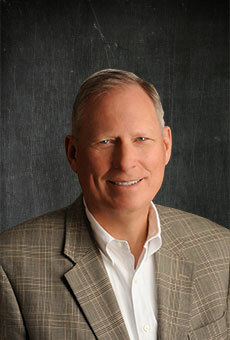 Arthur Kingsbury has been a Solera Board of Directors member since 2008, and a private investor in the Company since 1996. Mr. Kingsbury has over 35 years of business and financial experience, including financial, senior executive and director positions at companies engaged in newspaper publishing, radio broadcasting, database publishing, Internet research, cable TV and cellular telephone communications. Specific positions held included President and Chief Operating Officer of VNU-USA, Inc.; Vice Chairman and Chief Operating Officer of BPI Communications, Inc.; and Chief Financial Officer of Affiliated Publications, Inc. Currently he serves on the Board of Directors of HSW International, Inc. (a global online publishing company), and Dolan Media Company (a provider of business information). Mr. Kingsbury holds a B.S./B.A. in Business Administration from Babson College. Kenneth Viellieu, a veteran of the investment banking industry for almost 25 years, joined Solera’s Board of Directors in 2009. Currently he is a Managing Director (and Head of the Chicago office) of Moelis & Company, an investment bank providing advice on mergers and acquisitions, restructurings and other corporate finance matters and manages investment funds. Mr. Viellieu’s prior experience includes serving as Senior Managing Director and Head of Midwest Investment Banking at Bear Stearns, Managing Director and Head of the Chicago Office of Donaldson, Lufkin & Jenrette, and a position as investment banker at Drexel Burnham Lambert. He holds a B.S. in Accounting from Indiana University’s Kelley School of Business and an M.B.A. from the University of Chicago’s Booth School of Business. Prior to his investment banking career, Mr. Viellieu practiced as a Certified Public Accountant. Thomas Wajnert is the chairman of Reynolds American, Inc. (RAI), a NYSE-listed company. He previously served as RAI’s lead director, chairman of the audit committee and chairman of the compensation committee. RAI is best known as the parent company of RJ Reynolds Tobacco, Inc.
Mr. Wajnert is a member of the board of UDR, Inc. (NYSE), where he chairs the audit committee, and is chairman of FGIC, a privately owned financial guaranty company. Tom is also a senior managing director of The Alta Group, a leading global consultancy to the financial services industry. In addition, he is the retired founder, chairman and CEO of AT&T Capital Corporation, and served through the $2.2 billion management-led buyout and eventual sale of the company. A longtime resident of California’s Napa Valley, Tom and his wife, Theresa, own and manage TNT Vineyards.